I hope this isn’t too much of a surprise. Here you are, perhaps expecting yet another courgette recipe – or at least some kind of recipe involving food – and what do I want to write about: underarms. Nice. Well, I’m not going to go on about underarms per se, but the ‘management’ of the underarm. This is for two reasons: 1) many women are concerned about using antiperspirant-deodorants (I’ll just refer to them as deodorants from now on even though they are different) that contain aluminum; and 2) I am quite allergic to all ‘proper’ deodorants. To get my story over with I should say that, like some adults who do not have a history of allergies, overnight I became highly sensitive to something, in this case deodorant. It was a normal morning about five years ago, getting ready as normal, putting on my usual (aluminum-containing) deodorant. After the final swipe, BAM, underarms swelled alarmingly and became red, painful and massively itchy. The area was so swollen I couldn’t put my arms down by my side. Ice, antihistamine, ibuprofen – nothing helped much. This weird and horrible reaction did not subside completely for two weeks. You read that correctly, two weeks. So, thinking ‘wow, that was horrible so I must use a non-aluminium deodorant’, I tentatively rolled on one of those reassuringly expensive eco brands (I had a range of them already that I occasionally used). BAM, same reaction – but for three weeks this time. Miserable, sleepless and bewildered (not to mention a bit whiffy) I tried to find out why I had such an extreme reaction to something I had used since late childhood. I couldn’t get any answers from doctors, just shrugged shoulders and offers to do a patch test – no thank you! Nor was the Internet much help, except I did find a good deal of information on making one’s own deodorants. The latent chemist in me was intrigued. Breast Cancer and Deodorants: I’m really not sure what I think about the alleged link between deodorant use and risk of breast cancer. The studies and analyses I have read are quite mixed. On balance, studies and breast cancer charities tend to say that there is no credible risk, but that more research needs to be conducted. I would say so. Most women living in Western countries use something to control odour and wetness, so it isn’t exactly a niche research subject. There seems to be two main strands to the belief that deodorants cause breast cancer: 1) parabens in deodorants may cause cancer; 2) aluminum in deodorants/anti-perspirants may cause cancer. The latter tends to be most discussed and researched. Other peripheral issues abound relating to the inadvisability of blocking pores and the belief that microscopic cuts from shaving fast-track chemicals into our bloodstream. As far as the paraben link goes, parabens are preservatives that happen to imitate the activity of estrogen on breast tissue cells, but at a very low level. To my knowledge human estrogen ‘overwhelms’ any effect paraben might have. It is thought that because parabens have been found in cancerous breast tissue that parabens may be responsible for the disease in some women. The studies have largely been dismissed by cancer charities and scientists due to other tissues not being sampled as well – basically they have no benchmark, no ‘control’ samples. It is likely that most anything that makes it into the bloodstream may show traces in cancerous – and non-cancerous – tissue. Nor was it established that any build-up was due to deodorant use, as parabens are also found in other products with which we can into contact. Many deodorants in the UK and US deodorants no longer use parabens – check the label or manufacturer’s website if you are concerned. And then there is aluminum, or aluminium if you prefer. Like parabens, aluminum has estrogen-mimicking properties but it is used in deodorants to temporarily block the sweat glands. Bacteria in sweat is what causes odour, so blocking the source helps control odour. It has been thought by some that because many tumours are sited near the armpit that aluminum, and it’s duct-blocking and estrogen-imitating facets, may contribute to cancer over time. I’m summarising here, it’s a bit more complicated than that. In fact, breast tumours occur nearer the armpit because of the simple fact that there is more tissue in that area. The science blog at Cancer Research UK says it succinctly: more tissue = more cells. More cells = more things that can go wrong = higher chance of a cancer developing. Like paraben studies, the studies that have looked at the aluminum-breast cancer link are thought to be flawed in various ways. Studies largely have not used healthy tissue or healthy people as controls. But one interesting 2003 study did raise the possibility of a link by examining the frequency of underarm shaving and deodorant use among 437 women who had had breast cancer. Age of breast cancer diagnosis was ‘significantly earlier in women who used these products and shaved their underarms more frequently. Furthermore, women who began both of these underarm hygiene habits before 16 years of age were diagnosed with breast cancer at an earlier age than those who began these habits later’ (cancer.gov). Although this is by no means a conclusive link it is a finding that gives pause for thought, and cause for further research. Most breast cancer charities believe that more and better research needs to be done in this area. So far no one can say for sure that deodorants don’t have anything to do with cancer, just that most studies are a bit incomplete. As a realist and quasi-scientist myself, I like proper science to inform my decisions. But it is hard to quieten my instinct that sticking a bunch of chemicals under my arms for years and years on end is perhaps not a good idea. So many of us avoid smoking, drinking too much and eating chemical-laden foods, that it makes sense to me that we should also avoid putting too many extra chemicals under our arms, on our body and on our face. There is much about cancer that we can’t control so it makes sense to me to control the things that we can, and not worry too much about the things that we cannot. If you want more information about this topic, Cancer Research UK is good, as is the US site cancer.gov, which also holds this article from the American Cancer Society, the which I found a bit dismissive of peoples’ concerns. These sites also give references of scientific papers should you wish to investigate for yourself. I will monitor this issue and report back when the currently active studies report. In the meantime I give you my humble little concoction. My homemade deodorant spray (and others like it) has potent anti-bacterial and ‘drying’ properties, and works very well under most circumstances. It doesn’t stop sweating but does reduce it somewhat and seems to neutralise the odour. I do Zumba a couple of times a week and my homemade deodorant seems to do the trick even in these trying circumstances. I have had no complaints from family or friends, and no exclusion zone has popped up around me post-exertion. But, I must admit, when I am very nervous about something the deodorant is less effective. You will see that I have used vodka of all things as my preserving agent and overall bacteria zapper. You could instead use witch hazel, but this is hard to get as a pure product here in the UK. If you can get the witch hazel use it with the vodka. This seems to work best. Any nicks on the skin may sting – as with any deodorant – but it is temporary. You can find recipes that use baking soda and other powdery or waxy carriers and deodorisers but I have found them too ‘faffy’. Here are two good websites to explore if you want to explore other options: ecofriendlydaily.com and ehow.com. The essential oils that I use smell nice to me and seem to work, but you can use most combinations that suit you. To check suitability for use on skin and for compatibility with other essential oils, check here with this rather comprehensive African website. They also advise on appropriateness with regard to such things as sensitivities, allergies, pregnancy and the like. You may read elsewhere that sage and clary sage are highly effective deodorisers, but I would not advise using them as they have too many contraindications. I am no expert so please do have a look at this and these two websites to make sure my combination is right for you: Are Essential Oils Safe? (University of Minnesota) and Tea Tree Oil: Science and Safety (from National Institutes of Health in the US) – please read before trying any homemade deodorant. You may also like to ask a qualified herbalist for their advice. Here also is an interesting, if not particularly balanced, article: 10 Reasons Why Store Deodorant Stinks, from The Healthy Home Economist. Now to the recipes. You’ll notice I have also put together a chap’s version because my original one is a bit feminine for the average male. But you never know. My daughter really likes the manly one. For both deodorants use a dark glass bottle with appropriate sprayer (prevents degrading of the oils). For mine I go to Neal’s Yard where they sell their beautiful blue bottles as recycles for 50 pence, or something like that. The sprayers are new and cost about £1 each. Here’s the US website. For the essential oils, there are many places to find them but I prefer Neal’s Yard Remedies (this is the store finder page), Abbey Essentials and Tisserand. Whatever you end up getting make sure it is a pure oil rather than a blended oil, otherwise you are only getting a fraction of what you need for the deodorising and drying effects. 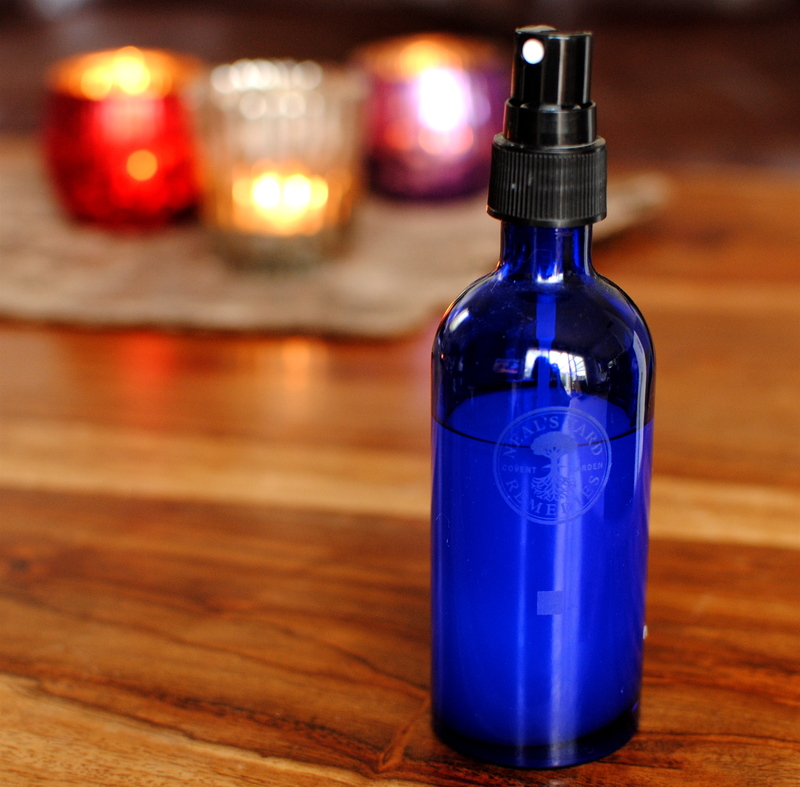 Always keep homemade essential oil-based deodorants in a cool and dark place. The oils I’ve chosen are easily available in most places that sell such things, but experiment with some of the less common ones if you like their aroma. For both of these deodorant sprays, add the oils directly into your glass bottle and top up with vodka and witch hazel. Close tightly with the sprayer and cap. Shake well before each use to redistribute the oils. You may also use distilled water in place of the witch hazel but it dries less quickly on the skin. I don’t think I can sign off without saying something about food, even if it’s not mine. I’m not much for convenience food as I have the time and energy to do things from scratch, and it’s my job to be a real food cheerleader, but on your behalf (ha ha) today I slurped down some lovely packaged noodles from Clearspring. At my nutrition workshops I advise those that are going through cancer treatment to find a few decent convenience foods to keep by in case they are unable to cook. Of course it is preferable to have homemade soups, casseroles, smoothies and the like but sometimes opening a carton or package is the best that can be done. This little packet of the familiar ramen noodles is reassuringly free of additives, weird stuff and the noodles aren’t fried before drying. 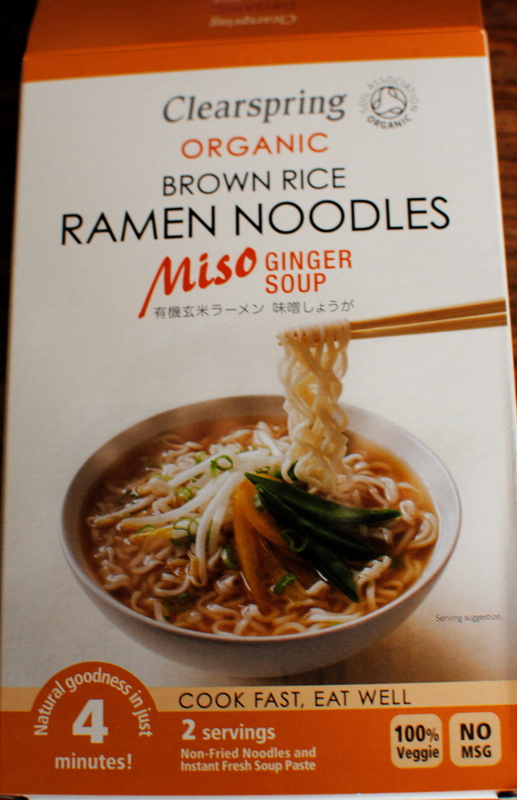 In fact, other than being a little bland (which is perfect during treatment) it was quite tasty. 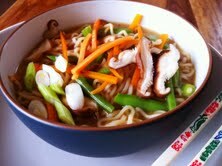 I supplemented it with scavenges from the vegetable drawer – spring onion, shiitake, carrot, while also adding my beloved umeboshi paste for a sour kick. I got it at Waitrose, but Clearspring is found in other UK shops too. If you have a healthy-ish storecupboard find that you would recommend for those going through treatment, do let me know. If I get enough recommends I will make up a list and stick it in the Nutrition and Cancer section as an easily-found page. Really interesting reading and I can almost smell your home made deodorants through cyberspace. I love geranium oil and ylang ylang so I really fancy this concotion. I think this needs to be made on a grand scale and sold in shops – I’m dreaming up packaging colours as I write. Hi Niki, that is so kind of you to think my deodorant could be commercial. However it is so simple that once folk realised HOW simple they would just make it themselves. Which is fine by me, although I would love to see what colour and package scheme you would have for it. It makes a gorgeous room spray and oil burner mix (minus vodka) too. Versatile. Wow! That’s an incredible story. I’m so sorry you had to go through that experience. Thank you so much for such an informative post. I’ve saved this to try myself. Hi Kristi, thanks for stopping by and commenting. Yeah, it was a pretty unpleasant experience but I really do prefer the homemade deodorant and don’t miss the old stuff one bit. I remember the chemical kinds tended to stop working and I would have to switch brands, but this doesn’t happen with a simpler deodorant, although it’s nice to change it for a different fragrance sometimes. Please let me know if you try it, and be honest about it’s effectiveness. It truly does work for me, so much so that the sleeves on my tops don’t smell of anything but lovely essential oils. Well, you know anything with vodka in it is going to have a head-start in brilliant from me! To be serious though, I got a package this morning via a friend of mine (bear with it) which contained a little jar of essential oil cream which is pure essential oils blended(?) into some very gentle cream. The idea is that I warm a little in my palms then slowly inhale with my hands cupped over my nose/mouth. (this is the relevant bit) – in that is Geranium Oil, Ylang Ylang, Bergamot and Orange Oil. I’ve never read much about the use of essential oils but I just thought it’s a kinda funny coincidence. That is a coincidence. Your cream’s combination is so lovely – both relaxing and uplifting. I burn oils nearly everyday, changing them according to how I want to feel – studious, relaxed, energised, etc. They really can influence how you feel, and that creams – and my deodorant – will keep you smelling good and feeling even better. Thanks for commenting, Rosie. Although I’m not convinced that commercial deodorants cause breast cancer I do think that if there is any doubt that it is reasonable to be able to use an effective and easily concocted alternative. I think my little recipe may be just that – at least for me. I can hardly believe that something so simple works so well, but it does. As nearly all essential oils are antibacterial maybe experiment to find a mix you like – I did mixing in little bowls. If you try it, please let me know how it is for you. Interesting. My hubby likes Pitrok, so might see if he wants to make his own! Hope he likes the look/smell of the masculine version. It makes me feel quite smug to make my own fab smelling potion & save all that money. Deodorants are ridiculously expensive. But I don’t have a choice! Thanks so much for sharing this, I tend to be hypersensitive myself at times, so will give this a try! I think quite a number of folk can be sensitive, maybe just not as dramatically as my event. Let me know if it works for you! Hihi May I know how do you use them both at once ? 🙂 spray the vodka with EO on the wet Crystal rock? Thanks !! Hi. Good question: wet alum crystal first then spray with EO deodorant. It seems to do the trick! Hello, so you are only using 1/4 cup of Vodka for the liquid?? Hi, thanks for getting back to me so quickly, that was great! So, you only make 1/4 of deodorant at one time? I guess that was what I was trying to ask. Sorry about that. I’d like to know where you buy your essential oils? I want to try this technique since I seem to run out of luck when it comes to store bought deodorants. (They never work on me) I perspire alot, and of course along with that comes BO. I may have to purchase this online, but I feel like many of the providers are claiming “organic hoaxes.” Is there a specific essential oil brand that you try? Hi there. I’m glad you want to give the natural approach a go. My ‘formula’ (if you can call it that) seems to work for me and for some others who have tried it, but if you feel like you are particularly sweaty and the odour is always unpleasant it may be worth seeing your doctor. Some people for whom deodorants just don’t work benefit from getting Botox injections under the arm. Extreme, I know, but I know it gives great results. When using my spray combine it with one of the crystal deos, as I think it may work better this way for you. I do this when I know I will be in a stressful situation. I don’t know where you are writing from (and thank you for writing) but the company I buy from is Abbey Essentials, here in the UK. Here is the link: http://www.abbeyessentials.co.uk/essential-oils. Good luck! So any vodka would work? I wouldn’t use flavoured, but an inexpensive regular one would do. Hope it helps! Hi Kellie, I would like to know if 1.69 oz is the right amount of Vodka? How much deodorant would that make? That sounds about right. The drops aren’t large and won’t add up to much more than a teaspoon and a bit. But I’ve never measured it altogether, just as drops. You may find it easier to spray if you either double vodka and oils, or dilute the vodka with boiled, cooled water. The later just increases the time it takes to dry on the skin. At least here in the cooler UK. I am going to give this “recipe” a try in the very near future. I have the same problem as you regarding intolerance to mass produced deodorant products. It causes unbearable itching for weeks afterwards so that I end up scratching like a chimpanzee. I did find a suggestion to use white vinegar and water spray as a homemade deodorant which I then combined with Pitrok. Better than nothing (I think ) but smells awful. Since I love essential oils I will give this a go …can I substitute the sandlewood for one I prefer do you think? Also does the vodka evaporate or is it made up in such small batches it really doesn’t matter? I will definitely feed back the results of my experiment. If it works I will be so happy! Thanks for taking the time to leave a comment. Yes, do sub the sandalwood for something else, or just make it up without sandalwood or a sub. I find that if I keep with natural clothing fibres the combination of this and pitrok works. But wearing polyester type clothing is a bit of a no-go for me. Also, I have never had a problem with evaporation, perhaps because I live in a cool climate. I hope this recipe helps you. Kellie – What an excellent article, thank you. I found this article because I was having the same underarm pain and bump like you described and I did a google seach that led me here. (FYI – I took an ibuprophen, put a dab of tea tree oil on the bump and massaged it for a few minutes and it felt immediately better, as well as distributing the lump so it wasn’t so big. This morning is the first time I can put my arms down without having shooting pain 🙂 ) Anywho… I am going to try your method to make my own. Thanks so much for all your info, this was really informative. I really want to try this deodorant but I don’t have any sandalwood essential oil at present and it is rather expensive; could it be substituted with another oil. all of the oils mentioned are natural deodorisers so just double up on another that you like the smell of. Or, could you get frankincense, as mentioned in the male version? The male version is actually my daughter’s preferred version – and she smells fantastic with it on! Thank you for replying so quickly; I will give it a go. I have just made this deodorant – I used orange essential oil instead of Sandalwood and I love the fragrance. My daughter asked me if I could make one with lemon and tea tree oil – I think they are both deodorisers but wonder if they are OK to use on the skin? I think they might be quite strong in that area, especially if one shaves. I found these snippets you may be interested in http://takingcharge.csh.umn.edu/explore-healing-practices/aromatherapy/are-essential-oils-safe. And http://www.guardian.co.uk/science/2007/feb/18/medicineandhealth.health I would read around as I am not an expert. I bet your pharmacist might be able to help. Thank you for those links; I have read them and they are very informative and a timely reminded that I need to be cautious with essential oils. I think I will stick to your recipe for now which I am wearing today. I’m glad they were useful. And I’m glad you wrote in. I’m sure your comment will be helpful to others who might read this conversation. I hope you like the deodorant! Is there anything else you can substitute for vodka? Hello, I made this for myself and love the smell but I made the manly scent for my son and he doesn’t like it at all. He says it smells bitter. Is there another combination I could try?? Most essential oils are natural deodorisers so perhaps let him come up with a combination from oils you already have, checking the links to make sure they are suitable for him. Or have him smell the ones listed for manly as individuals and eliminate the “offending” one. Kellie, I just found this gem of an old post of yours! What a great and well balanced article. I admit I’m using a junky deodorant at the moment, but I wax my pits once a month rather than shaving, so hopefully that helps with the aluminium absorption a bit. I’ve tried the salt crystal sticks in the past and while they were just fine for odour, I remember having to run and change my shirt on a warm day while I was giving a lecture to a bunch of medial students because my shirt was wet half way down to the hem. I gave up the crystal stick then and there. Does the herbal spray that you make have enough of a drying effect that this isn’t a problem for you? I find a combo of the two work pretty well unless it is quite hot or I am quite nervous (lecturing!!). The scent is really lovely too. Most of the is I use have drying properties but it is worth looking at my links to see about other oils to try. Good luck! This sounds interesting!! i really feel like trying it!! I think because of my reaction to even the natural organic ones I’m too nervous to try anything else. But as far as natural brands Lush sounds good. If I were to leave out the vodka would I double the amount of witch hazel to replace the vodka amount? Yes, as you need to achieve proper dilution for many essential oils to avoid dermatological reactions. I hope you like the deo! Thank you for your informative article. Can I use rubbing alcohol in place of the vodka? I’ll be trying this out today! I have suddenly become allergic to store bought deodorants as well. My lymph nodes painfully swell for weeks at a time if I try to use anything even the supposed natural ones. I’ve been going without anything and showering twice a day, but I need something for my upcoming vacation.